I actually started fishing after seeing other people at a little pond angling on a campsite, no one in my family fished so I actually ended up teaching myself through books from the local library! The usual story followed and many local lakes around Essex were fished for smaller species until the day I finally hooked into a carp…and got smashed up! 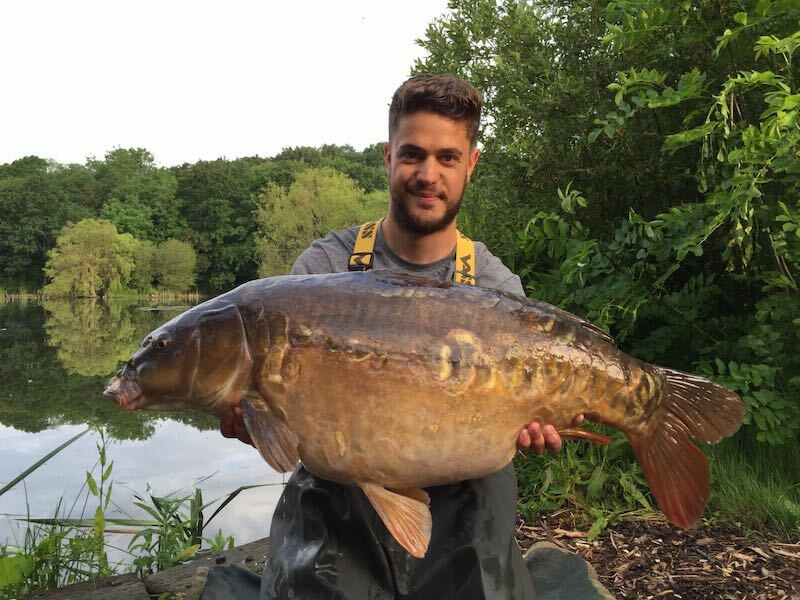 What followed is what could be described as an obsession and since that day I have always wanted to catch the biggest fish in any lake I fish with a lot of determination and effort I have managed to do just that! I have fished local lakes like hadleigh reservoir and after taking the bigguns out of there I graduated to the glorious blue lagoon, catching all of the lakes old residents. From there I joined my first ever syndiate the famous star lane, and was lucky enough to catch spike and the famous Linear a day apart. Since then I have fished many other day ticket and club waters, and more recently got a ticket for a lovely Essex syndicate with some real whackers in that I can’t wait to have my picture taken with! I still and always will have an obsession with setting targets and catching the lakes largest residents, and to do that I always use a quality food bait that will help me catch the largest carp in the lake through regular and accurate baiting, I actually visit the lake more to bait than I do fish and i believe pre-baiting is by far the biggest ‘edge’ in carp fishing! I started using eclipse baits a year or so ago to actually catch a fish I had been fishing for on off for many years and couldn’t catch. Looking through old catch reports it had come out 4 times on eclipse baits, so I got myself some to try. On my second trip out with the bait I finally caught her, and I have had 100% confidence in the bait ever since! In that time I have caught countless twentys, five U.K. Thirties and three U.K. forties on the virus, so when I was asked to become a consultant for eclipse baits it was a no brainier! I can’t wait to work with the team and look forward to helping test and help create many more jaw dropping baits for lots of other anglers just like myself to realise their dreams with!